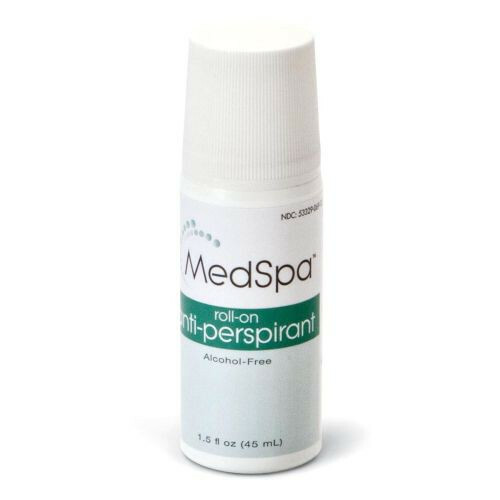 MedSpa Roll-On Antiperspirant/Deodorant is an alcohol free deodorant that protects against odor and perspiration. It is non-irritating on the skin and will not stain clothing. It is roll-on, 1.5 oz, and available by the case (96). MedSpa deodorant is ideal for young adults and adults. It is a great alternative to stick deodorants and won't leave unwanted residue on clothing. It has a pleasant fragrance and decreases underarm sweating due to stress. The active ingredients include Glycerin, Fragrance, Hydroxyethylcellulose, Polysorbate 20, Tetrasodium EDTA, Water, Aluminum Chlorohydrate, and 10% Anhydrous. Underarm Deodorant is also available in spray or aerosol, such as UltraSure Antiperspirant Deodorant Spray and Right Guard Aerosol Deodorant.